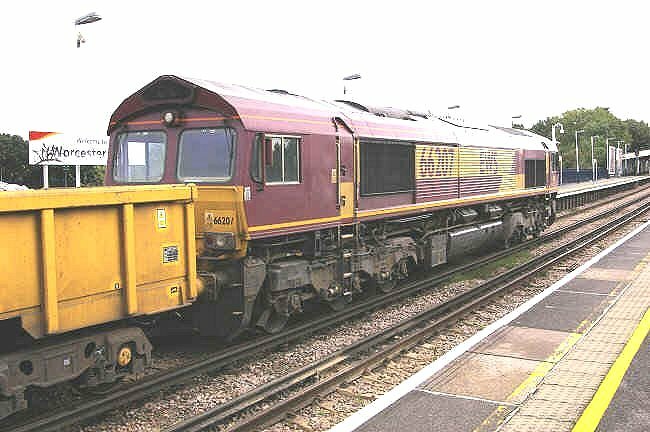 EWS locomotive 66207 approaches Worcester Park station with train 6N36 on 6th September 2008. 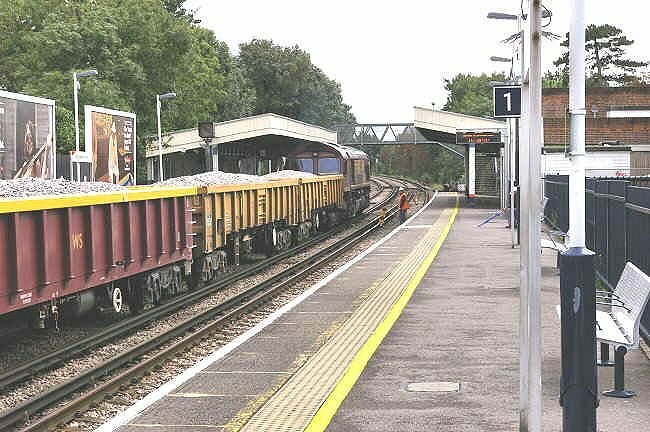 This train had run from Hoo Junction to Motspur Park before entering the engineering possession between Motspur Park and Epsom. This was a dull wet day, not best suited to railway photography. 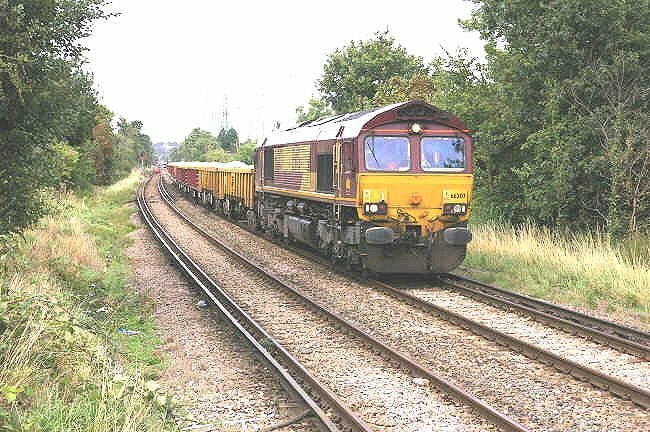 Locomotive 66207 at Worcester Park with train 6N36 carrying ballast on 6th September 2008. The structure on the horizon is the gas holder at Motspur Park. 66207 enters Worcester Park station and heads towards the work site. This class 66 locomotive was built at London, Ontario, in Canada by the Electro-Motive Division of General Motors (GM-EMD). 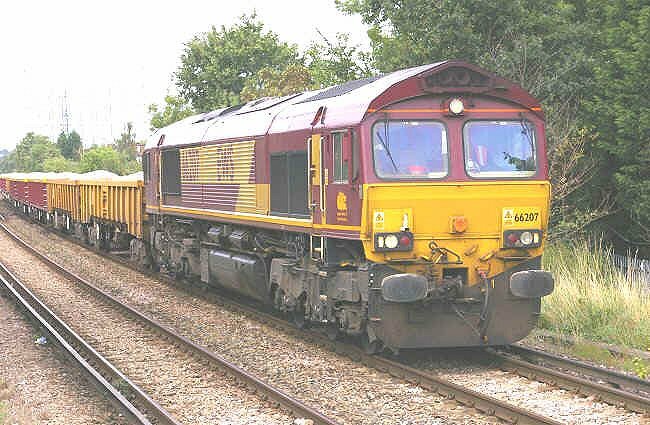 The second vehicle in train 6N36 was type JNA private owner wagon NLU 29156, belonging to Network Rail's National Logistics Unit. 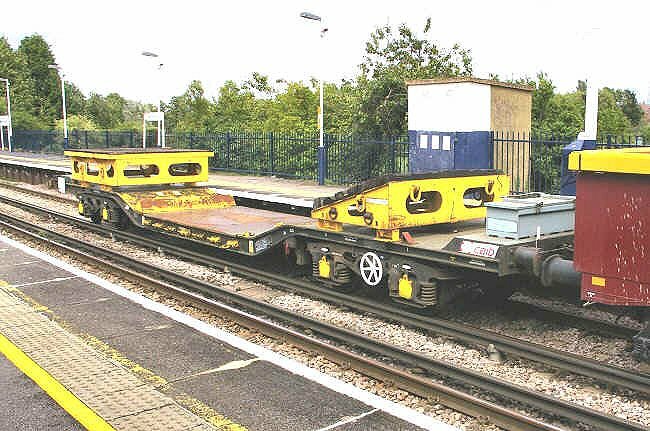 This was built at Arad in Romania by Astro Vagone between 2003 and 2005. The 14th vehicle in train 6N36 was type MLA wagon 503514, belonging to EWS. This was built by Greenbrier at the Wagony Swidnica works in Poland. 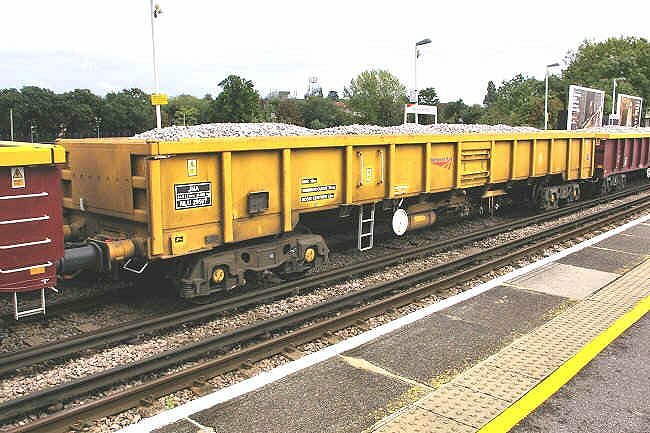 The 15th vehicle in the train was type JNA private owner wagon NLU 29507, belonging to Network Rail's National Logistics Unit and built at Arad in Romania by Astro Vagone. This type is known as "Falcon". The 16th vehicle in train 6N36 was type MLA wagon 503508, belonging to EWS. This was built by Greenbrier at the Wagony Swidnica works in Poland. The 17th vehicle in the train was type KWA privately owned wagon VTG 95628, belonging to German wagon hiring company VTG. This was built by W H Davis at Langwith Junction and had previously been owned by CAIB. 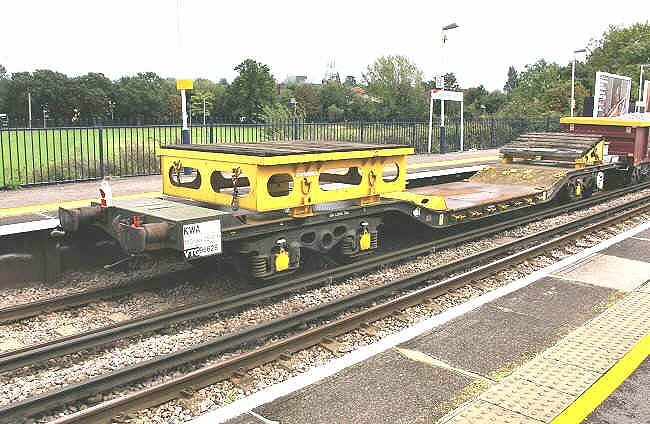 Another view of type KWA privately owned wagon VTG 95628. 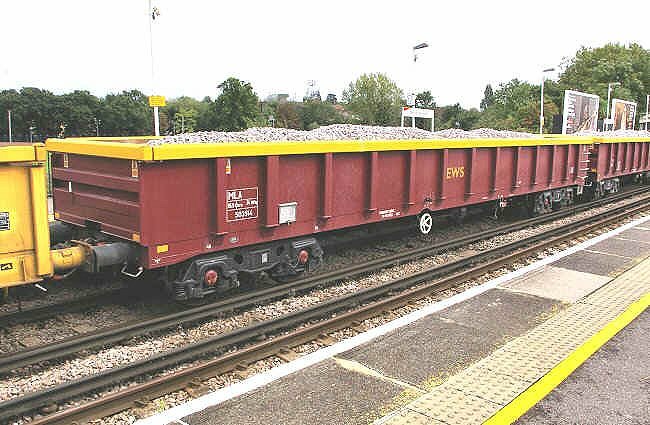 These wagons were built to carry excavators to and from work sites, and can also carry containers when required. The scene as 66207 passes through Worcester Park station with train 6N36. 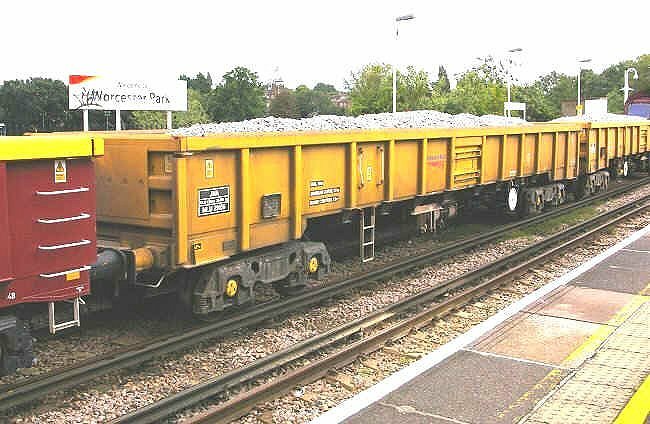 A final view as 66207 passes the engineering possession marker at Worcester Park station with train 6N36 and heads for the work site, where the ballast in the wagons will be unloaded by mechanical excavator. 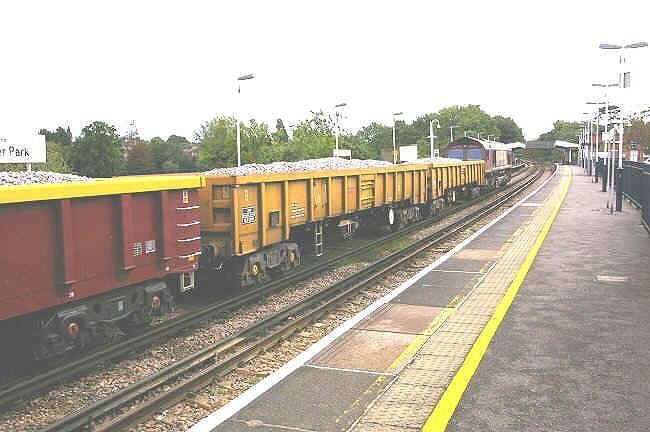 When unloading has been completed the train will continue on to Hoo Junction yard.